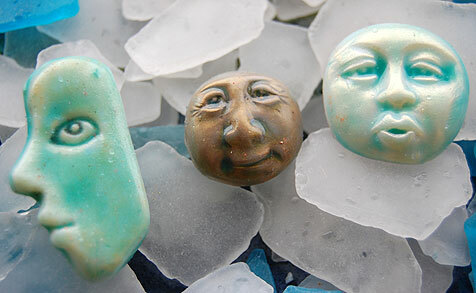 Last week at my RIPCG meeting, some of us experimented with creating glazed face cabochons. We started out with various colors of polymer clay and some purchased face molds. I used a blend of ecru and white clay. After the face was molded, we rubbed small amounts of Pearl Ex powder on the faces and cured them for 10 minutes. The ones above have macropearl, bronze and gold, going left to right. After curing, we mixed a couple of drops of Pinata ink (I used 1 drop each of Baja Blue and Rainforest Green) with some liquid polymer clay. I used the Kato brand while some of my fellow members used the Sculpey brand. I save the sauce containers from my Chinese food orders and they’re perfect for mixing small batches of paint or glaze. The faces went back in the oven for about a half hour. We noticed that the faces with the Kato glaze came out shinier whereas the Sculpey faces had a matte finish. With the profile face, I experimented further with some Tim Holtz Distress embossing powder in a Tea Dye color (of course!). I rubbed it over the face and popped it back in the oven for awhile. When I took it out, it looked like nothing much had changed. The powder was still sitting on top of the face so I rubbed it off and it left behind some interesting spots. I glazed again to seal in those rusty looking spots. I’m not sure yet what I will do with these faces. They might whisper to be used on one of my beaded journal pages. Or, perhaps a bead embroidered pin or pendant. Experimenting with glazing polymer clay has inspired me to create something for my January page that I’ve been puzzling over in my mind all month. It’s not done yet but I will post pictures once I have them made. A hint – pebbles on a path that spell out a message. If anyone has any experience with glazing polymer clay, I invite you to share your story. This entry was posted in Color, Creativity, Friends, Polymer Clay and tagged glazing polymer clay, RIPCG. I am just beginning to work with polymer clay – so I am reading this post with great interest. Thanks for sharing the results of your experimenting!